Even as the century comes to a close, the battle for the airwaves is becoming more strident. Newer technologies, big stars and bigger serials are the norm of the day. Over 50 channels with more than a 1,000 hours of original programming every day and a combined audience of over 70 lakh, is fast metamorphosing Indian television into a hydra-headed wonder, says Mukesh Khosla. THOUGH the small picture tube began blinking in India in 1959, it took over two decades for the image to become sharp. It was only in 1982 when the Asian Games were held in Delhi that the then Information Minister Vasant Sathe announced the introduction colour television for the first time in the country and promised to bring in a variety of programming. Seventeen years on, today, the small tube is not small any more. Thanks to the opening of the skies, it has virtually metamorphosed into a national obsession. Over 50 channels with more than a 1,000 hours of original programming every day and a combined audience of over 70 lakh, makes the Indian television network one of the largest in the world today. So widespread has been its influence, that it has penetrated into every nook and corner of the country cutting demographic and geographic barriers and thus bringing into the infotainment fold a vast multitude of masses. The National Channel or Doodarshan (DD) which was conceived as an instrument of social change has remained so and the initiatives undertaken by the government media have been reflective of this. Programmes focused on issues like social-values, beliefs, inter-personal relationships, agriculture, and national integrity have formed the core of its philosophy. Though critics may dub it as boring and uninspiring, the fact is that DD cuts across every strata of Indian society. On the one hand it caters to a mind-boggling variety of tastes and predilections and, one the other, it has to keep in mind the social responsibility which goes with such a powerful medium. Despite what the critics say, to its credit must go the fact that Doordarshan, over the years, has spread awareness and awakening on social evils. Caste system dowry, child marriage, health, family welfare, child development, empowerment of women, sanitation, population and more are its themes. Under the category of educational programmes, Indias first School Television (STV) was launched in October 1962. Lessons based on the curricula are imparting education to thousands of students in selected metros. In 1967, Doordarshan took another leap to integrate the agricultural community with the rest of the country. As a result, Krishi Darshan was born with the aim of familiarising rural viewers with the latest technological innovations on the agricultural front. One of the most popular programmes ever on TV because of its captive viewership, Krishi Darshan was curiously discontinued a couple of years ago but was quickly replaced with fresh programmes like Vikas Darshan and Krishi Bhai. Given its mandate of airing programmes with a social theme, the downside of the DD picture is that it has not made any serious efforts to make these programmes entertaining. Mandi House has let Babudom prevail to such an extent that people who have very little idea of handling TV programmes have many times been put in charge. Which explains why a growing number of urban critics have constantly dubbed its programmes as insipid, dull and yawn-inducing. "Our primary job is to spread awareness. We are not here in the business of entertainment," was the general refrain of the Mandi House mandarins which showcases the poor quality of its programming till the mid-eighties. However, things started to change by 1985, when the rapid expansion of television hardware in India increased the need for developing more software to fill the increased broadcasting hours. Production, which was till then being undertaken entirely by Doordarshan, was opened to private producers. There was an unsaid shift in strategy. Doordarshan ceased to be just a social responsibility channel and took its first hesitant step into the realm of entertainment but "with considerable restraint" as a bureaucrat puts it. Symbolic of this change was Hum Log, a soap opera which sparked off a virtual programming revolution. Written and directed by Hindi litterateur, Manohar Shyam Joshi, it celebrated social themes like respect for women, family harmony and population control. 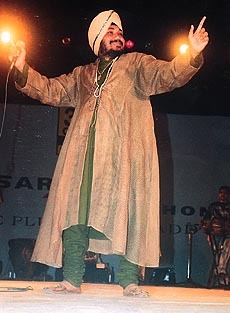 Audience research indicated that Hum Log made a deep impact on viewers, specially among women who identified with the character of Badki, a positive role model for female equality. The main lesson from the Hum Log experience was that indigenous soap operas had the potential of attracting a large audience in India. The success of Hum Log spawned a new era for Doordarshan. Soaps which aimed at giving development-related messages in an entertaining way became the buzz-word. Hum Log was followed by another landmark 104-episode soap, Buniyaad, which centred around the 1947 partition of India and Pakistan. Written by the same scriptwriter, Manohar Shyam Joshi, and featuring several of the same actors, it overshadowed even Hum Log in its popularity achieving the unheard of ratings of up to 95 per cent in North India. "These two soaps revived the value of the joint family system and impacted viewers immensely. People identified themselves very closely with the characters. It was like your own family on the small screen," says P.N. Vasanti, senior executive, Centre for Media Studies. If Hum Log and Buniyaad left a lasting impression, the next epic was going to create a history of its own. Ramanand Sagars Ramayana which took the slot of the best mythological broadcast ran for an unprecedented 18 months during 1987-88. Despite its poor production qualities, over 60 million people watched it Sunday after Sunday with many leaving their shoes outside and burning incense sticks in front of their TV sets. Ramayana fetched Doordarshan over Rs 9 crore in advertising revenues alone. The era of the mythological epics had arrived. Seeing the inherent potential of religion on television, B.R. Chopra too got into the act. 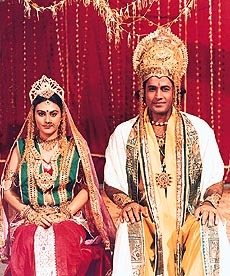 Ad this time the result was the classy epic, Mahabharata. Unlike the Ramayana, it has top production qualities and with a strong star cast and tastefully decorated sets which galvanised the entire nation for almost two year. By the turn of the eighties these early soaps which dealt with religion and middle class travails gave way to the big show. Serials like Yeh Jo Hai Zindagi, Swabhimaan, Andaaz, Khandan and Junoon rivalled the earlier epics in terms of popularity and viewership. These sit-coms mostly inspired by top American soaps like Dynasty and The Bold And The Beautiful were based on the lives of the rich and famous and instead of giving out any social messages they revolved around high society manipulations, two-timing spouses and corporate feuds. However, the popularity of soaps is complete without a mention of Humrahi, aired on Doordarshan during 1992 and 1993. Conceived and designed as a purposeful serial to emphasise the status of women in India, and dealing with problems like early marriage, higher education and empowerment, it was a success story from the word go. Says Akhila Sivadas, director, Centre for Advocary and Research, "The impact of some of these television shows revolving around the empowerment of women was so powerful that in a place like place like Gourinagar in Bhubaneshwar, after watching a serial called Phir Whoi Talaash, a girl forced her parents to grand her permission to marry the boy of her choice." Like in Bollywood, after social themes and religious epics, what followed were the historicals. Two landmark serials in this genre were Sanjay Khans well-made. The Sword of Tipu Sultan and Dr. Chandra-parkash Diwedis Chanakya. Dr Diwedi was later to become the CEO of Zee. Interestingly, the phenomenon of these epics, soaps and historicals also seemed to have an in-built self-destruct system. Because of the long duration of most of these epics and soaps, Doordarshan was left with very left with very limited time to introduce other types of serials. It was only logical for DD to start shopping around for a wider variety of programmes which ran for a shorter span. Thats when shows like Quiz Time and Turning Point opened new flood-gates of information in terms of news and views. Others like Surabhi and Discover India brought out the essence of the culture of India. Indeed, the decade following the introduction of colour television was an eventful journey. In 1984 the ministry of information and broadcasting introduced a new scheme called one transmitter a day. Starting with 46 transmitters in March, 1984, the numbers started swelling. In 1985, there were 172 and by 1993 this figure had gone up to 553 and as of date it as 984. Along with the number of transmitters, the population coverage also went from 30 per cent in 1983 to 84 per cent in 1993 and is currently close to 87.6 per cent. Coinciding with the silver jubilee celebrations of television in India, Doordarshan launched its second channel in Delhi on September 19,1984. This was followed by a second channel for Bombay, Calcutta and Madras. Some of the major milestones for DD were as follows: On February 11, 1987, it introduced the morning transmission with a two hour telecast. On January 1,1989, the afternoon transmission was launched and the target audience was housewives and children. In 1987, in a major development the Doordarshan took its first step to unify the medium by linking all transmitters in a particulars state with the primary transmission in the regional language originating from its capital centre. But the biggest boom came in 1991, when the Government decided to open up the skies and permit private satellite channels to telecast programmes. The era of the global television had arrived. Never before had the small screen offered such variety to the viewer. What was just a one-channel affair suddenly assumed the proportions of a hydra-headed wonder with private channels consolidating their positions and racing ahead for the numero uno spot. With the advent of satellite channels like Zee TV, Star TV, Sony TV and an array of others, the golden era of television had begun. What it meant was more channels, more programmes and more competition for the viewers attention. By 1995 there were 36 channels on TV catering to all kinds of tastes and the programmes became more varied and target-specific. The plethora of Channels came as manna from the heavens for many stars who had been shown the door by Bollywood. Suddenly the work load of all these semi-retired stars increased manifold and many of them who had barely stepped into studios for months at a stretch were now working triple shifts round the clock seven days a week to meet demanding deadlines. In fact, the born-again stars like Alok Nath Gupta, Shafi Inamdaar, Puneet Issar and Satish Shah whose ticket to fame were epics like Buniyaad and Yeh Jo Hai Zindagi had it so good that they started refusing offers. Smart ones like Arun Govil, Deepika and Vijay Arora were quite content to be treated like royalty on the small screen rather than try their luck again on the big screen once again. Even though the money being offered by some new channels was virtually a pittance, many stars made beeline for serials for the exposure they got across 38 countries where these satellite channels were being beamed. 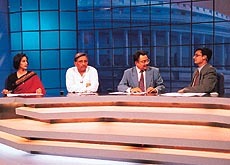 More than the Hindi and English channels in 1995, began the proliferation of regional channels. It was Sun TV which spawned the race followed by JJ TV, Rai TV, Gemini TV, Eenadu TV and Udaya TV. That these regional channels have a big viewer appeal can be gauged from the fact that in Tamil Nadu Raj TV began enjoying a penetration in 94 per cent cable while Sun TV claimed 98.7 per cent. Almost similar was the case with Malayalam channel Gemini TV and Telugu channel Eenadu TV. The mid-nineties also witnessed established players like Zee TV, Star TV and Sony TV consolidating their positions. Star TV resorted to India-specific programmes and an innovative pricing mechanism to push up its earnings. The battle started with great intensity in the movie arena as well. The war saw film-based channels like Star Movies, Zee Cinema, DD Movie Club, as main players, with ATN, Sony DD1 and DD2 slogging it out with all the masala at its command. Going-Hindi became the catch phrase in 1996. With Star, Discovery, Sony and even DD dubbing in Hindi, it looked like the era of western stars romancing in Hindi and other Indian languages had dawned upon India. Star TV also gained immense popularity with serials like Gaatha, Tu Tu Main Main, Daal Mein Kaala, Saans, as also talk shows by Simi Grewal and Priya Tendulkar. Countdowns programmes became the flavour of modern television. With Antakshri going great guns on Zee, Sony too decided to try its luck with a similar programme, Star Yaar Kalakar. The show hosted by Farida Jalal, was almost on the same pattern as its original inspiration though here the participating teams are led by well known personalities of the showbiz. DD Metro also introduced Superhit Muqabala, All The Best, MTV with BPL Oye, and Channel [V] with Videocon Flashback. Other music-based programmes included Hum Aapke Hain Kountdown, Ek Do Teen and Channel Vs Liberty First Day Show, and Winner Mangta Hai. 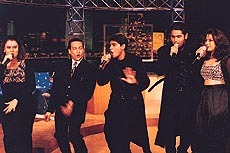 Like musical countdown shows, there was a virtual deluge of talk shows. Both DD and the private channels raced for the top slot in the category of the most provocative and responsive shows. Priya Tendulkar and Kiron Kher styled themselves after Oprah Winfrey. Divya Seth was high on Purushetra and hosts like Karan Thapar, Vir Sanghvi, Rajat Sharma became household names. But is was Shekhar Suman Movers & Shakers which turned out to be the mother of all talk shows. By1997, the new world of the small picture tube shifted to the mega-budget serials some rivalling price tags of big screen productions. Multi-starrer soaps like Swabhiman, Shanti and Vansh, slick fantasies like Chandrakanta and rib-tickling comedies like Shriman Shrimati and Kabhi Yeh Kabhi Woh, transformed television into a multi-hyphenated entertainment package. Unlike Hum Log and Buniyaad, which dealt with middle class travails, it was now the world of the rich and famous  the Singhanis, Ajmeras, Thakurs, Malhotras et al. And instead of any socially relevant messages, the plots began revolving around elitist intrigues, extra marital affairs and bitter rivalries. Lajoji of Buniyaad and Laloo of Hum Log gave way to Svetlana to Swabhimaan and Yash Thakur of Andaaz. The viewer had never had it so good. Housewives, who earlier found it hard to cope with their daily chores now miraculously wound up in time for their daily soaps. "Its an addiction," says sociologist, Usha Thakral. "The Peeping Tom syndrome works here. People take a morbid delight in seeing the reckless lifestyles of the rich and famous." There was an attempt to cater to every segment of the audience. Generation gap, that omnipresent phenomenon, now began to be exploited at length on TV, be it on music channels, talk shows or in sitcoms. By 1998 Prasar Bharati had become a reality which was set up to give a new look to Doordarshan. The sweeping changes envisaged included the phasing out of commercial films on the channel, axing of substandard programmes and no new programmes to be introduced till the earlier glut was cleared. However, nothing of significance has happened so far. Star TV suffered a major setback when it was denied the permission to set up direct-to-home [DTH] viewing. There was a parting of ways with Zee becoming independent. Both began vying for top honours with a slew of new serials. They were followed closely by Sony TV which was finally getting down to business for the supremacy of the air waves. With the coming of elections in 1998, news became big news. Prannoy Roys Star News became the first independent news channel. A year later, during the 1999 elections, Zee too had set up its independent news channel and both were fast gaining in popularity. On the sports front, both Star Sports and ESPN were providing excellent fare. But the bad news came from Doordarshan when it set up its sports channel and cornered most of the cricket tournaments with its money clout. Nothing wrong with that except that the programming quality was so poor that it left viewers exasperated. If Star TV, Zee and Sony were vying for the number one slots, Discovery Channel was the clear winner when it came to quality. But by 1999 it too had competition with the coming in of the National Geographic Channel. However by 1999 both seemed to be thriving and their ratings began rising steadily. Even as the century was coming to a close, the battle for the airwaves was becoming more strident. Newer technologies, bigger stars and megaserials became the norm of the day. There was no set formula for success any longer. The makers of weekly, daily, morning, afternoon, evening and late night soaps and long running megaserials whose success stories defied all logic of prime time slots, were laughing all the way to the bank.